Please be advised that the flow at the Hays Lake Dam will be increased from the current outflow of 0m3/s to 40m3/s today, Thursday, April 25, 2019. Residents are advised to exercise caution in this area. Stay Clear! Stay Safe! Please be advised that the Township of Terrace Bay's 2019 Municipal Budget will be passed at the Council Meeting being held on Monday, April 8, 2019, in the Council Chambers. Come on down and share your thoughts, express your ideas and learn more about what the Township is doing in 2019. Refreshments will be provided. The New Terrace Bay Council was officially sworn in to elected office on December 3, 2018 at the Terrace Bay Community Centre. 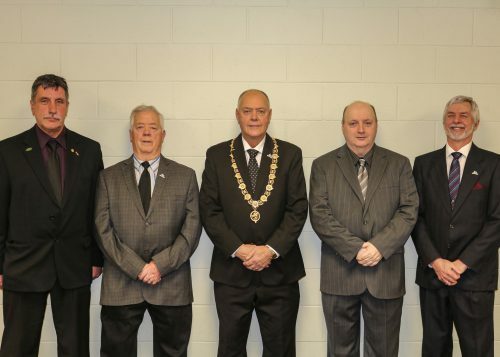 Pictured left to right are Councillor Paul Malashewski, Councillor Bert Johnson, Mayor Jody Davis, Councillor Rick St.Louis and Councillor Mike Moore. Reminder - christmas wrapping paper is not recyclable and should be put into your regular garbage. The Township of Terrace Bay invites residents to witness the signing of the Oath & Declaration of Elected Office of our Council on Monday, December 3, 2018 at 5:45pm - Terrace Bay Community Centre - Conference Room. Refreshments will be served. We have met the Ontario Drinking Water Protection Regulation and therefore, the Precautionary Boil Water Advisory for the residents of Terrace Heights (87,85,83,81,79,77,69,52) and all of Southridge Crescent has been lifted effective Thursday, November 8, 2018 at 2:30pm. If you have any questions or concerns, please contact Stan Spadoni, Treasurer/Deputy Clerk at 825-3315 ext.227 or cell 229-7186. TO ALL TERRACE BAY RESIDENTS. This is a friendly reminder that in accordance with By-Law No. 95-18, The Uniform Traffic By-law, Section 22, Winter Overnight Parking, Subsection 22.1, no person shall park or stand a vehicle on a street or highway effective from 1:00 a.m. to 7:00 a.m., between November 15th and April 15th of each calendar year. Please note that this By-law will be enforced. Thank you on behalf of the Township of Terrace Bay. The Boat and Kayak Docks at the Terrace Bay Beach will be removed for the season on Wednesday, October 31st. The Township of Terrace Bay will be holding a public meeting on November 19, 2018, regarding an amendment to the Zoning Bylaw to regulate the parking and storing of recreational vehicles, boats, quads, snowmobiles and utility trailers in the Low Density Residential (LDR) and Multiple Residential (MR) Zones. physically handicapped and provide proof that you are financially unable to make arrangements (i.e. disability pension). Residents are advised that the flow at the Hays Lake Dam will be increased from the current 19m3/s to 28m3/s today, Friday, October 5, 2018 and to exercise caution in this area. Stay Clear! Stay Safe! RESIDENTS ARE ADVISED that the flow at Hays Lake Dam will be increased from the current outflow of 0cms to 15cms today, Thursday September 13, 2018 and to exercise caution in this area. Stay Clear, Stay Safe! ROAD CLOSURE NOTICE for Radisson Avenue road reconstruction on Friday, September 7 to Friday, September 14. Motorists – road will be closed with detour in place. Pedestrians – Access will be provided. Come out to hear what your Mayoral, Council and Trustee candidates have to offer on Tuesday, September 25, 2018 at 7:00pm in the Michael King Hall. There will be opportunity to ask questions from the floor from the residents. For a list of candidates visit our Election Page. Sponsored by the Aguasabon Chamber of Commerce. Applications will be accepted until noon on Friday, September 7, 2018 or until all positions are filled. ROAD CLOSURE NOTICE for street reconstruction! July 30 to August 31. Radisson Avenue (will be closed at Simcoe Rd & Laurier) Motorists - road will be closed with detour in place. Pedestrians - Access will not be provided. Nominations are open until Friday, July 27, 2018 at 2:00pm - Terrace Bay Municipal Office. The Township of Terrace Bay will be holding a public meeting on August 7, 2018, regarding an amendment to regulate the parking and storing of recreational vehicles, boats, quads, snowmobiles and utility trailers in the Low Density Residential and Multiple Residential (MR) Zones. BLASTING - JUNE 19 TO 23. Our construction activities on Kenogami have encountered bedrock within the project limits that will need to be removed. Removal will require drilling and blasting which will commence tomorrow June 19, 2018 through June 23, 2018, during daylight hours. The Township of Terrace Bay Mayor & Council invite all Terrace Bay Residents 60 yrs and older to their Annual Seniors Appreciation Night on Wednesday, June 27 at the M.King Hall. Doors open at 5:30pm. Buffet Dinner at 6:00pm followed by CASINO AND BINGO GAMES. Now that we're in the summer season, here's what you need to know when it comes to dealing with problem black bear in town. The Ontario Renovates Program aims to assist low to moderate income home owners in remote areas to repair their homes and bring them up to acceptable standards while improving the energy efficiency of residences. This program also offers a grant/contribution without an affordability period, portion designed to increase accessibility through modifications and adaptation. The Ontario Renovates Program is once again accepting applications. Application can be accessed on our website. Funding is limited and is on a first-come, first-served basis. In addition, for communities with a population of 2,500 or less, Infinity Property Services also operates an Ontario Renovates Program and currently has funding available. Their application form can be downloaded from their website. Summer Hours at the Landfill Site are now in affect from June 1 to October 15. Open 2:00pm to 6:00pm on Monday, Wednesday, Friday, Saturday & Sunday. Closed on Tuesdays & Thursdays and Statutory/Civic Holidays. Residents are advised the flow at the Hays Lake Dam will be increased today, Mon June 4, 2018, from the current 50m3/s to 64m3/s. Please exercise caution. Stay Clear, Stay Safe! Residents in these areas can expect a Water Outage between the hours of 9:00 a.m. to 4:00 p.m. (approximately). We advise affected residents to please shut off main water valve and turn off hot water tanks to avoid any damage during this outage. Once water service is restored, if residents experience discolouration of the water, please run a cold water tap until the water runs clear. Please contact the Municipal Office for further information if required. We apologize for any inconvenience. • Significant increase to around 100cms from 16cms. If spill increases to 121.8cms flooding may occur. Stay Clear, Stay Safe! The Fire Burn Ban has been lifted. Residents are reminded that a fire burn permit is required in the Township of Terrace Bay, and if you haven’t purchased yours yet feel free to stop by the Municipal Office to purchase a 2018 permit. Notice to Residents – FIRE BURN BAN is in effect! The Township of Terrace Bay will not be issuing any fire permits until after the fire ban has been lifted. If you have any questions please feel free to contact the Municipal Office at 807-825-3315. Thanks for your cooperation. Have a great and safe Victoria Day Weekend! Use of the landfill site will be FREE of charge from May 12 to May 19, 2018 inclusive for residents of the Township of Terrace Bay. Public Works will do townsite pick-up from residential properties as per the schedule listed below Monday, May 14 to Wednesday, May 16, 2018 inclusive with no exceptions. Are You on the Voter’s List for the Municipal Election? Are you on the voter's list? Check to see at www.voterlookup.ca The next Municipal Election will be held on Monday October 22, 2018. Please be advised that Bill 68, Modernizing Ontario’s Municipal Legislation Act, 2017 (“MOMLA”) is now law. It passed and received royal assent on May 30, 2017. Terrace Bay Wins – 2017 Best of the Lake! Congratulations, Terrace Bay! The Lake Superior Magazine just awarded the town the Best Visitor Information Centre, Best Lake View, Best Family Destination, Reader's Choice - Best Home and Best Scenic Drive in the 2017 Best of the Lake Awards for Ontario! A big congratulations to Drifters for winning the Ontario - Best Lodging and Best Restaurant. This is a reminder that, in accordance with Bylaw No. 16-2012, a Bylaw to Prohibit the Feeding of Wildlife within the Corporate limits of The Township of Terrace Bay, Article 3, 3.01 (c) regarding Bird Feeders, using bird feed only between the period of November 1 to April 30. We ask that you please abide by this bylaw due to prevent the attractant of black bears during the remaining month. Please note that this Bylaw will be enforced! Terrace Bay CivicWeb Portal Launch! Find out what's happening in our community!